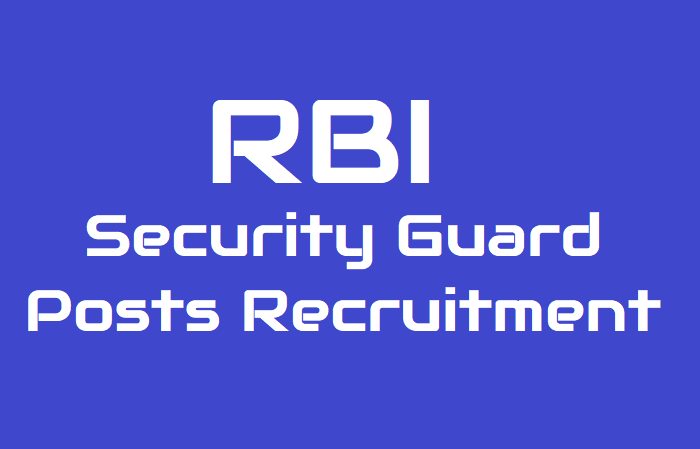 RBI Security Guard Posts 2018 Recruitment Notification: The Reserve Bank of India (RBI) invites applications from Indian Citizens (Ex-Servicemen only) residing in all states for the post of Security Guards. Before applying, candidates may ensure that they fulfil the eligibility criteria for the post. The number of posts. eligibility criteria, how to apply and last date for applying are as given here. Reserve Bank of India invites applications from eligible ex-servicemen candidates for 270 posts of “Security Guards” in various offices of the Bank. Selection for the post will be through a country-wide competitive Test (Online Test) followed by Physical Test as per Annexure I. Application can only be submitted online through the Bank’s website www.rbi.org.in. No other mode of submission of application is available or acceptable. Minimum standard 10th pass. Maximum under-graduation. The selection is confined to Ex-Servicemen with proper military background and having experience of handling arms and ammunition in the military. Between 18 and 25 years. Candidates born not earlier than 02.12.1993 and not later than 01.12.2000 (both days inclusive) are only eligible to apply. Relaxation in the upper age limit: The upper age limit will be relaxed as under subject to maximum age limit of 45 years. 1. Selected candidates would be required to guard Bank’s property (residential / offices) and attend to other watch and ward duties at Hyderabad office / Bank’s residential quarters. Candidates will be shortlisted on the basis of marks in Online Test. The shortlisted candidates will have to appear for a Physical test which will be of qualifying in nature. From the candidates who qualify in the physical test, a merit list based on the marks scored in the online test shall be prepared. These provisionally shortlisted candidates will have to successfully complete document verification, biometric verification and any other procedure as may be decided by the Bank. They will also have to undergo the pre-recruitment medical test. Final selection will be done based on all these mandatory procedures. Candidates must apply through online mode at rbi.org.in. 3. Schedule of Online Test (Tentative): In the month of December 2018/January 2019. The online test could be conducted on a weekday or weekend. RBI reserves the right to modify the number of days and dates of test depending on the number of applicants. Last date for submission of application: 30.11.2018.